Today is my cousin Trudi’s 44th birthday. It is her 23rd birthday in eternal life. I was still stumbling my way toward my teen years when Trudi was murdered. Trudi and her older sisters were thick as thieves with my older sisters while I was just one of the little cousins in our extensive family circle. I remember her as cool; fun and beautiful; bold and humorous. This weekend I spent hours addressing Christmas cards. As I scribbled the names, streets, and cities of my cousins, I couldn’t help wondering about Trudi. Would she live in the same area, like her sisters, or would she have established her life elsewhere? Would we have attended a wedding? Would our children have played together by now? Would we have that comfortable, enjoyable dynamic that develops between family members after the years have placed us on level ground? Hypotheticals. They do an excellent job of muddling the mind and stinging the heart. There’s nothing like loss to leave you wading through a pool of hypotheticals. 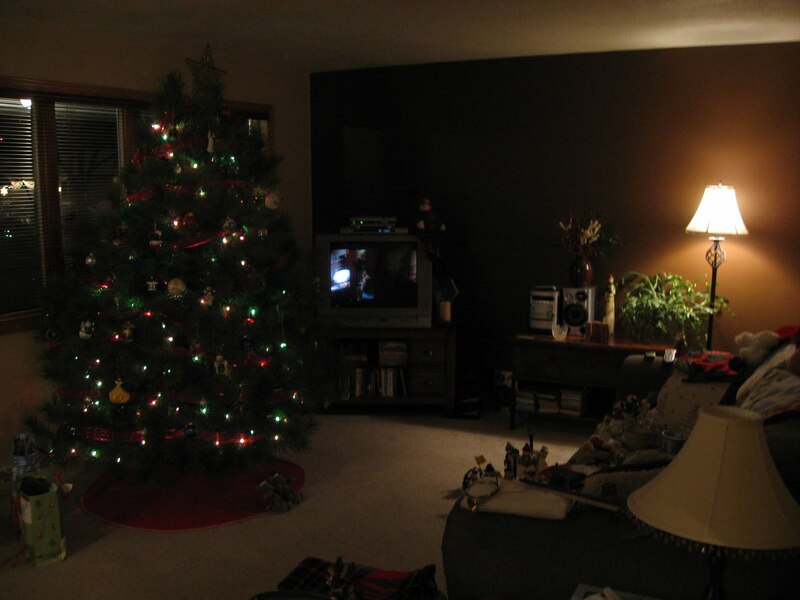 And there’s nothing like Christmas time to amplify the wound of loss. This isn’t a direct quote, as I can’t remember where I heard it, but I once read that St. John Paul II said suffering is created by feeling cut off from good. We live and love and link ourselves to sources of good. When one of those links is severed, we are left trying to patch the tear. What has severed a link to good in your life? Every cut in our connections to what is good is felt keenly in this season of celebration. For some, the suffering renders Christmas undesirable. Potential joy is swallowed up in misery. Sounds of peace are drowned out by the roar of hypotheticals that can never be. Oh, the paradox of Christmas. For Christmas, my friends, is the arrival of the Divine Response to every wound and cut and tear you carry with you. It is Almighty God dwelling amongst us. He made Himself vulnerable to encounter our vulnerability. God entrusted Himself to the arms of a mother, to the home of an earthly father, and to a community of imperfect, suffering individuals. Christmas, when “the Word became flesh and dwelt among us” (John 1:14) is the root of our conviction “that neither death, nor life, nor angels, nor principalities, nor present things, nor future things, nor powers, nor height, nor depth, nor any other creature will be able to separate us from the love of God in Christ Jesus our Lord” (Romans 8:38-39). Two years ago my last grandparent, my maternal grandmother, passed away. 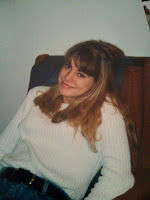 Her death came in the week before Thanksgiving and so inevitably she enters my thoughts a lot in this holiday season. 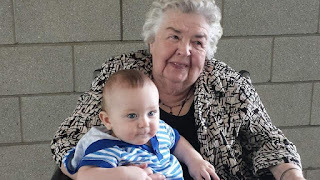 Similarly, it is summertime when my paternal grandmother comes to mind most often as my final memory of her was a family picnic at my parents’ house on a warm summer day. Sunshine warmed grass between my toes, family sitting in chairs in the yard, Grandma Theresa makes herself present with us. Now, in the bustle of family focused holidays and age old traditions, Grandma Evelyn is here with me. 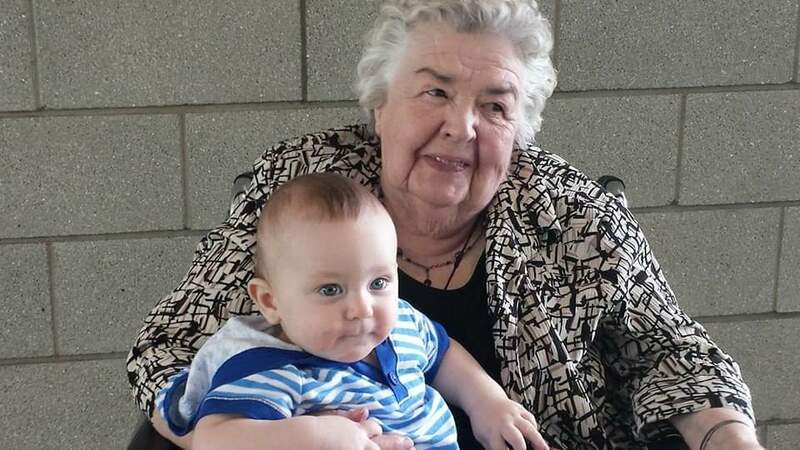 Grandma Evelyn with my firstborn, a few months before she passed. During Sunday Mass last weekend, I leaned over to my husband and whispered, “Grandma would have loved this men’s choir.” The rich, reverent harmonies could have been from any number of old albums of hymns she used to play on her cassette deck next to her favorite chair. I savored every song during that Mass, enjoying it on her behalf. Then at the end of Mass, I approached the giving tree set up near the sanctuary. Typically I choose a request for a child’s gift from these trees. It gives me a special kind of joy to know a young child will be happier on Christmas day thanks to a small sacrifice on my family’s part. 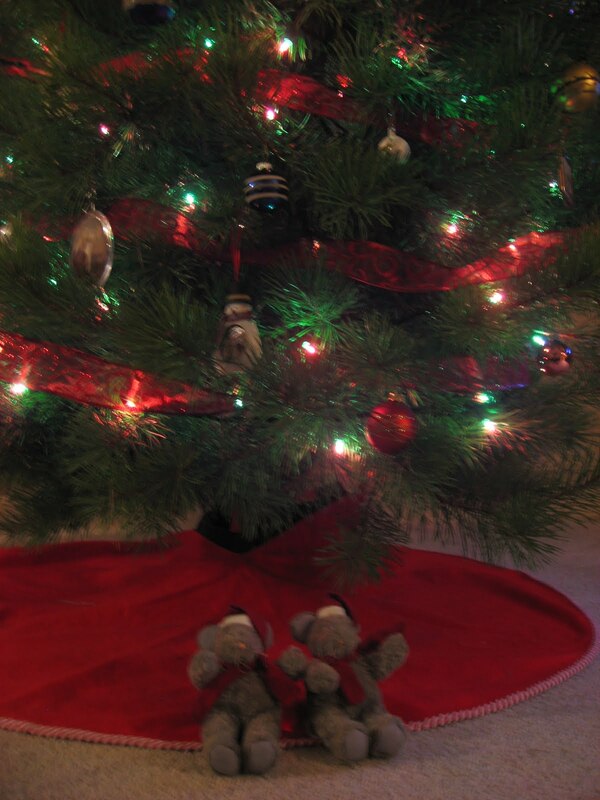 It was with this same intention that I went to find this year’s star on the giving tree. But what did I find on the first star I read? A little Christmas wish list for an elderly woman that could have been my grandmother’s list pretty much every single year. My eyes filled with tears and I swallowed a lump of emotion in my throat as I plucked the star from the tree. I get to shop for my Grandma. When I read that Christmas list and kept thinking, “she would have loved that,” with each item, I realized something I hope I won’t forget. Remembering our loved ones gone from this world is a special thing but loving on others with the very love your heart has marked for the ones you lost is immeasurably greater. A month and a day since my last post and what a month and a day it has been! Three days after that post, I became engaged to my boyfriend of 1 1/2 years. Matt proposed to me at my family’s Thanksgiving gathering. It was a sweet, surreal, memorable moment and I’ve barely come down from the clouds since. Even with the expectation of our engagement coming about before the end of 2011, Matt still managed to surprise me on the occasion of his proposal. Not once in the midst of cooking turkey and baking pies that morning did it cross my mind that I might be engaged before the afternoon has passed. Since that Friday, we have managed to schedule our date at our church, with our priest and with the reception hall of our choice. Yesterday we chose a photographer. The rest will wait until next year. It is an exciting, praise-God-for-His-plans time in our lives. And now we come to Christmas. That annual feast that never ceases to bring a spirit of expectation, joy and warmth, no matter how many times we celebrate it. It is the mystery of that Child born in the humblest of circumstances, that He can reach through the centuries and still touch the hearts of each of us. Even those who don’t realize it’s His doing! The spirit of excitement and love takes hold in us all to some degree. Let it in! Let it fill you up! I pray that this Christmas pours its spirit into our lives, spilling over to all whom we love. In between the cooking, the cleaning, the gathering, the gift giving and receiving, and so on, may we take a moment to contemplate the Christ Child! And so it begins! It’s Thanksgiving week and that will usher us into Advent, which will build to Christmas which will fly by to New Year’s. I love this busy, blessed, overwhelming, enjoyable time of year. Truth be told, every time I look at the calendar I feel like someone is pulling a prank. How is it already time for Thanksgiving and all that follows?! Tonight we’ll attend the annual Appleton Christmas Parade then my sister and I are watching the Hallmark movie, “An Old Fashioned Thanksgiving.” Wonderfully cheesy and sentimental, just right to usher in the season. I am trying my darnedest to not become overwhelmed this week… or in any of the coming weeks. The forced facing of the reality of living without a personal computer is the opposite of helpful. My laptop took a devastating crash this weekend and the tragedy has me in a bit of a panic. There is online shopping to be done! And keeping abreast of friends’ holiday adventures via facebook! And family email exchanges to settle plans with each other! I need to figure out what saint to ask for intercessory prayer for my hard drive to be restored. In the meantime I shall comfort myself with Matt’s homemade pumpkin pie ice cream and blogging during work hours. I don’t know about you but it can be awfully hard to remember what I’m preparing for during this season. Okay, not that hard. I mean, I’m buying presents, baking cookies, listening to Advent themed sermons on Sundays. Obviously it’s Christmas that we’re preparing for in these present weeks. Better put, it can be difficult to appreciate and understand the result of that which we’ll celebrate on the 25th. Contemplation is a lost art. Stillness of mind and heart can seem impossible or even counterproductive. We always have to be doing enough, saying enough, moving enough. I’m as susceptible to this as anyone. But if I quiet down and hold still, what might I find? I might find that God is with me. I might find His presence to be full of consuming, transforming peace and joy and hope. All the things we wish for one another in our greeting cards, we’re walking through life surrounded by. They hang about us like the particles in the air of this room, invisible until we stop moving and look at where the light shines brightest. 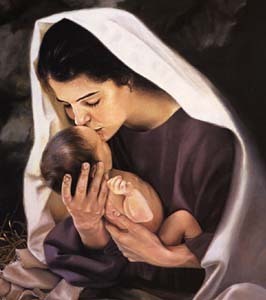 Mary knew how to do it, always “[keeping] all these things, reflecting on them in her heart” (Luke 2:19). Joseph knew how to do it, aware that the actions he took to be the guardian of the Savior were more important than any words he could speak. So our record of him in Scripture holds no words of his own, only listening, hearing the Word of God guide him, and acting upon it. Simeon knew how to do it, waiting and praying year after year for God to reveal the Messiah. His preparation made him know that Messiah the moment he saw the Holy Family enter the temple. With a little practice now – taking a bit of time each day to pray, reading through the Scripture story of the arrival of my Savior, thinking over this extraordinary truth as I perform ordinary tasks – maybe come December 26 and into the new year, I won’t forget that God is with me. Christmas brought Emmanuel, “God With Us,” but every morning brings another day that He is with me, another day for me to acknowledge and thank Him for being with me, another day to speak and move and act in a manner that declares I know He is with me and I choose not to forget. God is with us… may we always remain with God. The Incarnation – the event of God becoming man, the 2nd Person of the Trinity, the Son, taking on a human nature – is the sort of event that alters the course of human history. It is the definitive move by God to usher in the great work of our salvation, thousands of years in the making. It is also, arguably, the most humble act of God. There are dozens of ways to describe humility and dozens of examples of lives characterized by that virtue. As well, there are plenty of reasons to strive for humility in ourselves and encourage it in those we influence. However, no better description, example or reason can be found than Jesus Christ, Himself. Our human mind tends toward the belief that to do great things we must be greatly acknowledged and honored. Success is achieved by audacity and notoriety. 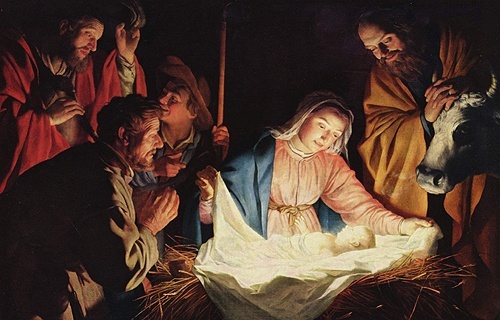 What do we make then of this Heavenly King born in the quiet of a hidden stable? What could be accomplished by such an entrance into human history? Why would God decide to come in this manner, without a display of pomp and power? What we make of it ought to be exactly what Christ stated in the Gospel: “I have given you a model to follow, so that as I have done for you, you should also do” (John 13:15). This Advent, consider the effectiveness of humility. Like Christ, you can enter the scenes of life with humble actions and attitudes yet working for great and glorious things. Trusting not in the power of ourselves but the power of God in us, we can do more than we could imagine. With willing obedience to God the Father’s laws and guidance, you will become a conduit of His love, mercy, strength and compassion. No work of our own, good as it may be, can produce what God’s work can produce. No words of our mouths can convey truth as well as His words. No outreach of ours can reap the changes in this world like His outreach can do. When we submit ourselves to the Lord as His son or daughter and servant, He humbles Himself yet again, as He did at the Incarnation, and works through us in this world. Amongst our families and friends, in the daily grind of the workplace, in the quiet times of prayer, God will include you in the work of His hands. He may bless you with the rewards of your humility here and now, but without question, “your reward will be great in Heaven” (Matthew 5:12), where the Lord keeps for you “an inheritance that is imperishable, undefiled, and unfading” (1 Peter 1:4). Lord Jesus Christ, I pray that you may fortify me with the grace of your Holy Spirit, and give your peace to my soul, that I may be free from all needless anxiety and worry. Help me to desire always that which is pleasing and acceptable to you, so that your will may be my will. Grant that I may be free from unholy desires, and that, for your love, I may remain obscure and unknown in this world, to be known only to you. Do not permit me to attribute to myself the good that you perform in me and through me, but rather, referring all honor to you, may I admit only to my infirmities, so that renouncing sincerely all vainglory which comes from the world, I may aspire to that true and lasting glory that comes from you. Amen.